When I was a kid, I distinctly remember a store called Motophoto. It was a photo development shop. There were a few of these stores in our area. I remember the excitement of going after vacations or events to get hard copies of our memories. But as time went on and technology evolved, this store disappeared like a whisper in the wind. In Eat Drink Tell Your Friends' Photo & Supply, a similar shop is on the verge of closing its doors set against the backdrop of a changing society. 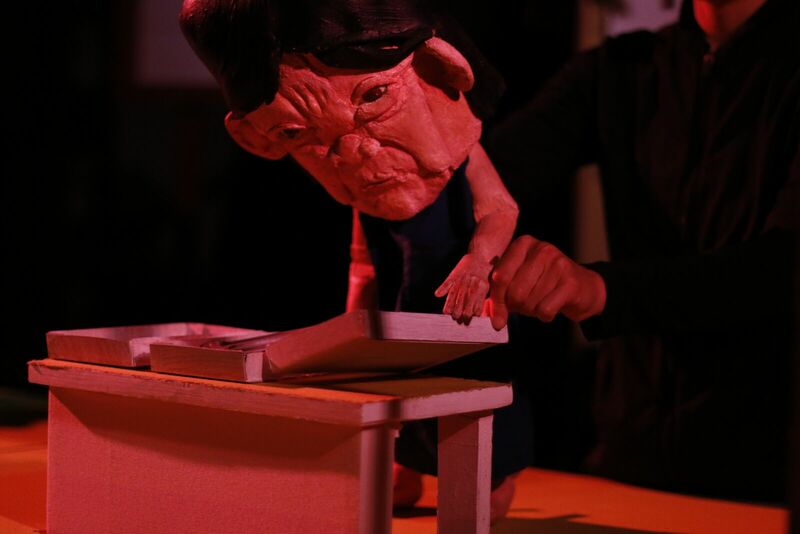 As part of The Tank's Flint and Tinder series, this experimental work from Eat Drink Tell Your Friends is a surrealistic puppet show about closing up shop and the sense of community that this one place brought as time and people change. If you go in blind to Photo & Supply, you'll be bound to get lost and have to play a game of catch up. With no dialogue, well comprehensible dialogue that is, this story is told entirely through physical puppetry and some sound and music accompaniment. Directed by Andy Manjuck, Photo & Supply is on its way to being something worthwhile. The vantage in which they're telling this story is unique. But there were some faults and flaws that pulled the show backward. First and foremost, the Eat Drink Tell Your Friends team did a commendable job in the space. You must be able to get rid of belief to fully engage with this piece. But the lighting and scenic design occasionally forced the illusion to break. The unfortunate light leak that seeped over or the ability to see the body despite the attempt to go pitch black in the back, even having to walk in front of the puppet platforms sadly affected the overall aesthetic. But the vision Manjuck brought displays great hope when the execution in the entirety of the elements can be achieved. Puppets and shadow work were at the forefront of the piece. When you have no words to tell the story, there needs to be some sort of soundscape to subside. Just look at the hit The Woodsman. But there were many silent beats. Sure, there is a power in silence if it's earned. There needed to be more of an underscore pop, whether it was from sound effects or music. This isn't a show to play on mute. There was daring craftsmanship but the puppets lacked a common vocabulary as they each seemed to live in a different world. The puppeteers ability to concoct this story through limitations was strong, especially with the central puppet Phyllis. It was her story and her physicality was compelling, even if tedious. Infusing a less passive activity into her could help the momentum. The best puppet of the bunch was the red dog. Talk about coming to life. If that personality matched the rest of the show, Photo & Supply could be next level. Photo & Supply is a great example of the courageous work that comes through the Flint & Tinder series at The Tank. But this one wasn’t as polished as it could have been. Keep your eye out for the next incarnation as Eat Drink Tell Your Friends has a unique perspective in storytelling.